Each new Moon offers a fresh start, as does each new breath! But there is something doggedly universal about dragging our old stuff around with us, and holding our breath when we are stressed. Dogs offer us an alternative. They greet new opportunity with delight, and humor, forgive themselves and their people for bad behavior, and go on to take full advantage of the moment. This new Moon is the entry to the Year of the Dog in the Chinese zodiac. The best way to celebrate the new Moon and New Year might be to take on the energy of a dog on a spring morning and roll in the grass of contentment. The chart for the new Moon in Aquarius features the Sun and Moon (the luminaries) in the center of a wide swath of planetary relationships. Like a scene from King Arthur in happier days, court members, Venus, Hera, Mercury are in close attendance, and visitors from afar: Uranus, Eris, Jupiter Chiron and Pluto send messages to the royal couple. Expect that the next lunar cycle may bring a hundred opportunities for friendship and community, love and appreciation with every excuse to celebrate! If you dance with this Sun Moon combination, you will absorb the pleasures of all the planetary energy focused upon you. Jupiter is in a degree of Scorpio with a beautiful image: A Rabbit Metamorphoses into a Nature Spirit! Here’s a transformation we might all embrace at this season of change. I have a garden full of rabbits, but even as they eat everything I plant, they give me a tingle of delight with their company. Animals offer a gift of vision with their presence. They say their wildness is safe with us. They remind me that spirit, as well as rabbits, are all around me. New England winter takes a pause after Imbolc (Groundhog’s Day) is celebrated. Twilight has extended into the palpable magic of promised change. It is a time when we can look, and then look deeper to find the wheel of the year spinning around us. This is why I love the month of February with its undercurrent of new life beneath the mud and ice and snow of winter as it revolves into a flirtation with spring. We experience a warm promise and then a cruel setback. Yet our houseplants tell us they know the change is irreversible. And the festival of Imbolc is the energetic jolt of spring no matter how deep the snow may be piled. Feel her furry breath, as she approaches. Uranus also makes an angle to Sun and Moon on their royal thrones. He offers the vibrational energy of new visions, but always, always in ways unexpected. His electricity is necessary to jolt us all into the season of growth, new possibility and gives the voltage enough to carry us into the audacity of some crazy hopes and dreams, a future we can embrace rather than fear. Like Mercury, Uranus is a messenger, but unlike Mercury, emissary of the Sun, Uranus seems to speak for another deity, a different form of organization of the universe. His Sabian Symbol at this moment is: A man possessed of more gifts than he can hold. The Full Moon on Saturday is the first of two in Sagittarius. The issues of Gemini and Sagittarius will be open to us over the next twenty-eight days. This doesn’t happen often, so it must be a way to keep our attention on the issues of these two constellations, occurring again June 20th with another full Moon in Sagittarius. Gemini can be summed up as our words and thoughts, Sagittarius as our beliefs. The Gemini Sun scintillates in the double energy of twins. Once again the hawk rises and sails. Mercury is the messenger of the Sun and ‘rules’ Gemini. It takes tremendous courage and discipline to hear the message coming from the solar center. At the moment of this full Moon, Mercury is traveling in retrograde motion, but on Sunday, the 22nd, he will station direct at 14° Taurus. The theme of hawk and falconer, so strong at the new Moon in Taurus is ready to soar again as Mercury returns to direct movement. Sagittarius is often full of ‘passionate intensity,’ and Gemini tends towards mental babble. What about these next two full Moons is offered in the way of balance? Perhaps it will be the asteroid Vesta, nestled next to the Sun, who can give us some real guidance at this time. If the full Moon energy makes you feel dizzy with chatter, think of the cleansing and purifying aspect of this goddess who represents the hearth and the need to cleanse and reorganize our spiritual home. Venus is there as well, still in her sign of Taurus, in a degree dedicated to adjustment and adaptation. But the Moon is less sanguine. Mars is her companion, their Sagittarian arrows pointed toward the Sun. What beliefs can justify violence? We all contain the passion of beliefs; political or spiritual. Where do we point our barbs? What ideas do we defend rather than explore? This all reminds me of the last days of Arthur’s Court when friend turned against friend to destroy what they most wanted to defend. Meanwhile, lest we get dragged down into too much air and fire there is an earthy trine in this chart, which promises a way out, the potential for stability. Mercury in Taurus, Jupiter in Virgo and Pluto in Capricorn, manifest the possible energy for new structures. Is there a third way in some ‘either or’ Gemini conundrum you face at this time? Must the Sagittarian arrow be let loose during an endless replay of Game of Thrones. What might the earth energy of Jupiter/Mercury/Pluto create? In Aleister Crowley’s Thoth deck, the Thee of Discs speaks of the Alchemical marriage. The card contains the symbol of Mars in Capricorn, but this time we have Pluto in Capricorn. Since Pluto is sometimes called the higher octave of Mars, we can look for some divine energy to build a pyramid of creative effort. The Rider Waite deck inserts human endeavor into the process. The vision of the cleric, the design of the architect and the craft of the mason combine to create a cathedral, which will last for thousands of years. What does the cathedral hold? It is a reflection of the earth, which is our home cathedral. Over the next few days as the Sagittarius Moon fills our window with the light of reflection from the Gemini Sun, we might find a way to become visionaries, designers and masons of our deepest soul desires. This new Moon would be a perfect moment to reaffirm vows to the Earth. It takes place at 16° Taurus, close to the astrological degree of Beltane, 15° Taurus. The Sun and Moon are embraced by Mercury and Venus and twirl in a earthy grand trine with Jupiter and Pluto. Take a moment to celebrate the sweetness of the unfolding spring fire in earthy form. Friday (Venus’ Day), May 6 is the day of all this earthy and Venusian energy. If you take a moment to join in the chorus of bird, beast and flower you will never feel ‘alone’ again! Mercury in Taurus, represents Gwalchmai, ‘the Hawk of May’, Gawain in the Arthurian stories. He is a powerful yet compassionate knight, Arthur’s nephew, and one of the sons of Lot from Orkney. His most famous story is Gawain and the Green Knight, when his honesty is tested, and although not perfect, proves who he really is. And the new Moon tests our mettle; we travel through darkness and even after Sun and Moon have met, the darkness continues, so we don’t always recognize a beginning when we are already there! We often have to launch our boat in the dark of the Moon so that when she can be seen setting at twilight as a crescent, we are already on our new voyage. The Moon is ‘exalted’ in Taurus. She likes it there! Taurus is under the rule of Venus so to have Venus in Taurus in close proximity showers us with the beauty and power of love, which this planet represents. The degree for Venus in this chart is associated with ‘The ability to create inner happiness in dark hours. Faith in cyclic renewal.’ By watching the cycle of the Moon and the seasons wherever we live, we gain a tremendous power to be regenerated. Holidays are an important way to be aware of the continuous change, which marks our lives, and which has the power to give us a sense of hope in discouraging times. Mercury’s Sabian Symbol is ‘white dove flying over troubled waters. The spiritual inspiration that comes to the individual in the overcoming of crisis.‘ Again, as with Mercury, we are offered a hand during a time of crisis. Perhaps these symbols of hope are offered by the embracing arms of Mercury and Venus to the conjunction of Sun and Moon because their symbol represents a crisis, personal or societal, or both: ‘A symbolical battle between “swords” and “torches.” Refusing to depend upon the past, the seeker turns warrior, fighting anew the eternal “Great War,” a polarization of values.’ It feels as if we are given world wide view of the those who favor swords, and those who favor torches. People are in a struggle to understand which will bring us closer to peace. Each of us must battle to understand and make a connection to our soul through each lifetime. We are bodies of light, yet struggle with illusion. It is the Earth element, which might come to our aid. If we look at the Jupiter/Pluto/Sun/Moon trine in Earth, we can get a glimpse of hope in troubled times. Our feet walk the Earth. Like The Empress, the Tarot card who represents Venus. We are at home here, when we take time to lie back in the arms of the Beloved Mother. We are given a triskele of Earth on this new Moon day. Jupiter opens and blesses, Pluto deepens and empowers. There is constant motion in this shape, whirling and moving through space in a shape reminiscent of a galaxy. and come down in rain. and to return as light. This all happens in a flash. A meeting has been called in the sign of Pisces. Gathered together are Mercury, the messenger; Neptune, the visionary; Ceres, the earth mother; the new Moon, queen of cycles; the Sun, a king in eclipse; Chiron, the wounded healer; and the South Node in Pisces, the location and timing of this solar/lunar event. The flavor of this stellar event is Pisces; the theme is compassion, intuition, mystical knowledge, music, and addiction to what can’t be seen, but can only be felt: A Love Supreme, https://www.youtube.com/watch?v=clC6cgoh1sU. John Coltrane’s opus, A Love Supreme sets the tone for this total solar eclipse on Tuesday, March 8. Coltrane’s ascendant, his soul gate is at 2° of Pisces. The Sabian Symbol for this degree is: Petrified tree trunks lie broken on desert sand. Keynote: The power to preserve records of their achievements which is inherent in fully matured culture. Indestructability. Music is both ephemeral and transcendent, like Pisces. Love, like music renews itself with each phrase, just as the Moon renews herself with each new Lunar cycle, and as we renew our connection to life with each new breath. You won’t see the eclipse unless you are in Eastern Asia, but this combination of planets, a total solar eclipse, and the closeness of the Moon (Perigee) to earth means the lunar and Piscean energy will reverberate wherever you are. This is a moment to stop and take note, to listen to what must be healed within and without. The Moon is always invisible at the time of the new Moon. All this has to be felt, and it can only be felt if you honor this celestial event with some form of consciousness. Meet the new lunar cycle in mystery and darkness if you can. You can become part of the stellium in Pisces with meditation, music-the music of your soul, and water. Float a candle in a bowl of water and listen to some music which reconnects you to a Love Supreme. Jupiter is in perfect opposition to the new Moon and Sun. He’s one of two planets who rule Pisces and set the tone for this zodiac sign. He is the King of the gods on Olympus (Zeus), and expands our spirits through optimism and hope. Some say he supplanted the original monarch of the Greeks, Hera. Juno (Hera) in this chart is trine to Ceres (Demeter). Are we going to see a flood of female energy return to balance a long imbalance of male energy, as illustrated in the American election drama? Yet neither political party speaks to the cause of Demeter, our earth mother. This chart has the potential to bring attention to the environment, with yet another warning about the way we dishonor our home. The outer planet ruler of Pisces is Neptune, who is part of the confab of planets, which are teaching us Pisces’ values. To feel another’s pain and pleasure is the genius of Pisces. The Age of Pisces began around the time of Christ and is now on the wane. At that time, two thousand years ago, a prophet symbolized by a fish, also the symbol of Pisces, spoke of the importance of love; ‘love thy neighbor, as thyself,’ a very difficult commandment. The sacrificial aspect of the fish became a theme in Christian doctrine. Yet often it was applied to the poor and to women, and left out the powerful and men. Uranus can’t wait to set fire to the establishment. Expect more in the way of change and the resistance to change. Saturn makes a square to Jupiter, on one side and on the other to the Sun/Moon/Ceres drama. The outlet for all of this is in Gemini. Gemini is communication, and a kind of nervous energy, which can make polarities seem like irreconcilable opposites instead of equal parts of a whole. 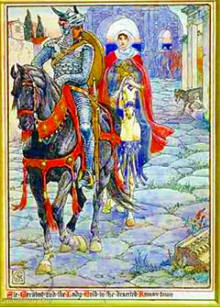 In the Gemini card (The Lovers) from the Arthurian Legend Tarot we are offered another view of polarity. Gareth and Lyoness walk side by side in the forest. Their relationship does not consume or eliminate either one. As the seasons change so does their bond. The usual sense of this card as one of choice, takes on an evolutionary tone. We don’t have to eliminate contradictory elements in our nature. Astrology shows us the complexity of our nature held within a circle, a living picture of many parts which ‘feels’ change. And one last player cannot be overlooked. Pluto trines Jupiter and makes a sextile to the luminaries. His influence as Death, as Lord of the Underworld is always triumphant, offering us the power of our own being. Don Juan in Journey to Ixtlan says to Carlos: ‘Death is the only wise advisor that we have. Whenever you feel, as you always do, that everything is going wrong and you’re about to be annihilated, turn to your death and ask if that is so. Your death will tell you that you’re wrong; that nothing really matters outside its touch. Your death will tell you, ‘I haven’t touched you yet’.’ Carlos Castaneda. King Arthur’s Round Table, created by Merlin was a gift from Uther Pendragon, Arthur’s father to Guenevere’s father King Leodegrance. He in turn gave it as a wedding present to Arthur. As an example of how astrology has been integrated into the Arthurian mythology, there is a legend, which suggests the Round Table was designed as a circle of the zodiac with twelve of his knights, a representative of one of the twelve signs of the zodiac. This becomes tricky because there are so many variations and names of the Round Table fellowship. One of the names associated with the Zodiac is Caer Sidhe. Since Sidhe refers to the Faerie realm, this adds another dimension to the stories, and we could look at the faerie women of the Arthurian stories as members of a Round Table, which operates on another plane. 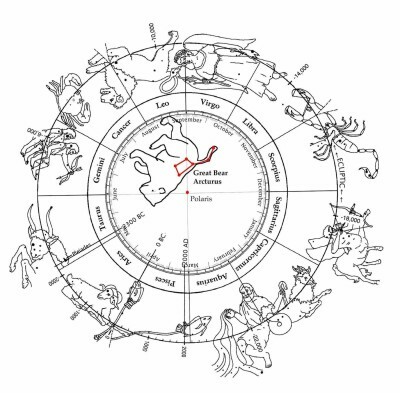 The circle of the Zodiac is reflected on the land in several areas in Britain. 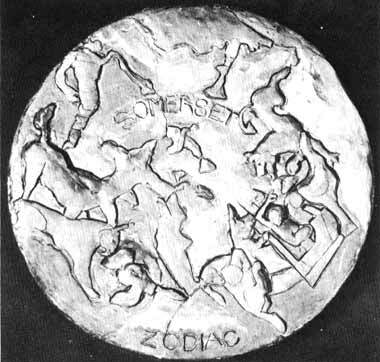 The most famous is the Glastonbury Zodiac, described by Katherine Maltwood in 1935. She called this the Temple of the Stars. Laid out on the landscape which surrounds Glastonbury are the figures of the zodiac, which she traces to Sumerian colonists. Reflected upon the land in this way, the cosmos gives great legitimacy to twelve landed families who might claim to be at the root of history and mythological origins of Britain. She makes a thorough correspondence between the zodiacal signs and characters in the Arthurian legends, which vary, for the most part from my connections. 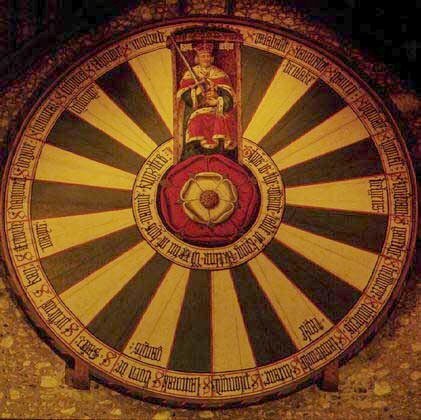 The Round Table symbolizes the equality of each of Arthur’s knights, just as the Zodiac contains twelve archetypes of equal power, although not of equal size in the sky. Arthur is the still center, the pole star around which Caer Sidhe—The Zodiac rotates. 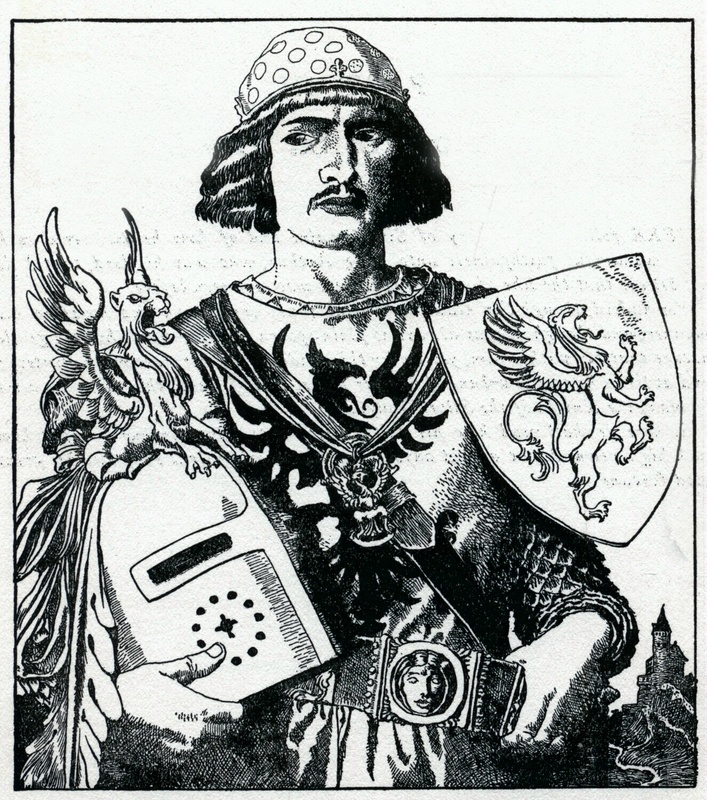 Gawain, Arthur’s nephew is the first to be knighted for the Round Table, and so might stand in for Aries, the first sign of the Zodiac. When the sun is rising, Gawain gains in power. After the Sun reaches its height at noon, Gawain’s strength diminishes. This would suggest his role as a solar hero. The Sun is in exaltation in this sign which Mars rules. He is famous for his impatience and temper as well as his courage and loyalty. He is most fully described in his bargain with ‘the Green Knight,’ a retelling of the ancient battle between the dark and light of the year. King Pellinore’s illegitimate son, Tor is my choice for the second seat at the table. Tor (Taurus) has been raised by his step-father Aries, who is a cowherd. He was raised in a family of earthy peasants who lived with cows, very Taurean, yet, perhaps with the help of Venus, the ruler of Taurus, he immediately feels at home in Arthur’s court. Despite his noble blood, he is an illustration of the equality of the Round Table. Gemini is the constellation of twins, and Balin and Balan, seem like good candidates for this position. They are the tragic brothers destined to kill each other in error. 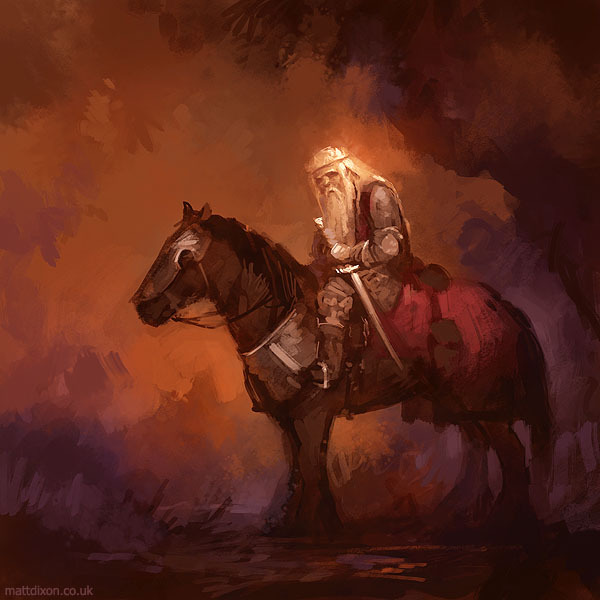 Balin takes a sword from a damsel and becomes known as The Knight with Two Swords. He is warned that if he keeps both swords, he will kill the man he loves most in the world and bring about his own destruction. Ignoring this prophecy, he battles his brother who is in disguise and both die. The polarity of Gemini seems fatal in their case. The Lady of the Lake must be honored, perhaps in the position of Cancer, as her role is as Lunar force is as important at the Solar power of Arthur. She and the other Faerie women are a parallel to the Knights of the Round Table. The Moon rules Cancer, a watery cardinal sign. Like the Moon, the Lady appears and disappears, but is central to the story of Arthur. She gives Arthur his magical sword, Excalibur and the scabbard, which prevents fatal injury. When Arthur is mortally wounded she and other magical women take him to the Island of Avalon, memorialized in the sky as Caer Arianrhod. She rules an alternative kingdom with its own strategies and priorities a watery reflection of Camelot. Leo seems most likely to belong to Lancelot du Lac. Leo is fiery and fixed, ruled by the Sun and connected to the heart, to courage, and to love affairs, all very synonymous with this very important character in the later tales of Arthur. His courage and faithful heart seem to be the embodiment of Leo. Like Leo, Lancelot struggles with the transformation of ego into heart. His love of Guenevere, and his loyalty to Arthur create the theater for this process. Shall we try Galahad as the embodiment of Virgo? Virgo is a mutable earth sign ruled by Mercury and known for the ability to discern and analyze to a point of perfection. Galahad is the pure and perfect knight who successfully obtains the Grail. He is the son of Lancelot and Elaine, conceived through the trickery of Elaine’s father the Fisher King. 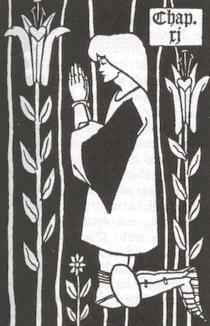 In his birth to the virgin Elaine, his purity and solitary wanderings, he personifies the Virgo archetype. Galahad (or in other stories, Percival) is given the seat at the Round Table called the ‘Siege Perilous,’ which has been awaiting his arrival as prophesied by Merlin. The story of Sir Geraint and Enid is a tale of marriage reflective of Libra, the sign of partnership. The scales represents the equality necessary for a successful partnershiop . Geraint misunderstands his wife and believes her love has moved away from him. He takes her on a long journey in silent rage and battles innumerable enemies. Finally after many tests of his valor and her fidelity and love, he drops his fury and understands her faithfulness as an expression of her character, not his physical superiority. She meanwhile has found her own strength and voice through this ordeal. 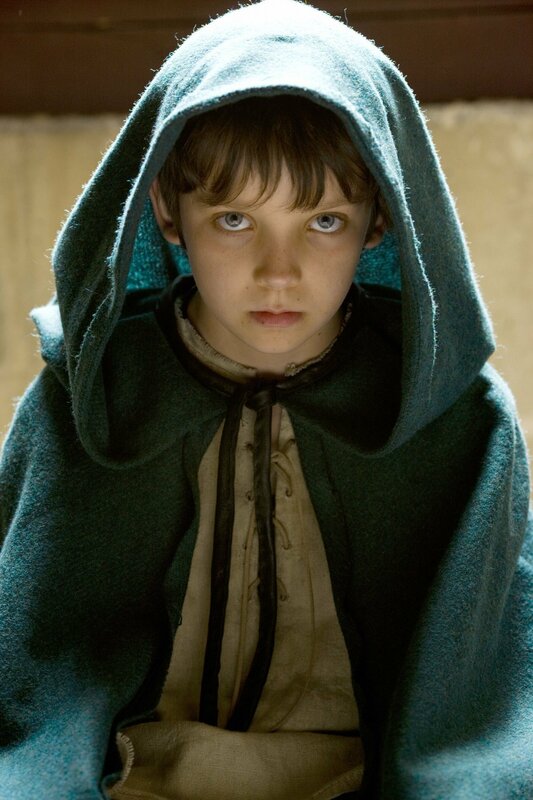 Scorpio belongs to Mordred who brought death and destruction to the fellowship of the Round Table. A fixed water sign ruled by Mars, Scorpio has connection to death and sexuality, the underworld and transformation, and the necessity for truth to surface. Modred’s hatred for Arthur is not without reason. Because of a prophecy that a May baby will destroy him, the king orders all babies born that month to be put into an old ship which sinks. Only Mordred is rescued and returned to Arthur’s sister Morgause and her husband Lot. Mordered is a Scorpionic survivor of infanticide, a vengeful shadow of Arthur and a reminder of the Slaughter of the Innocents in the Christ story. He is both Arthur’s incestuous son and his nephew, an unavoidable nemesis. Merlin takes his place in Sagittarius, for this is the sign of the priest and the shaman. 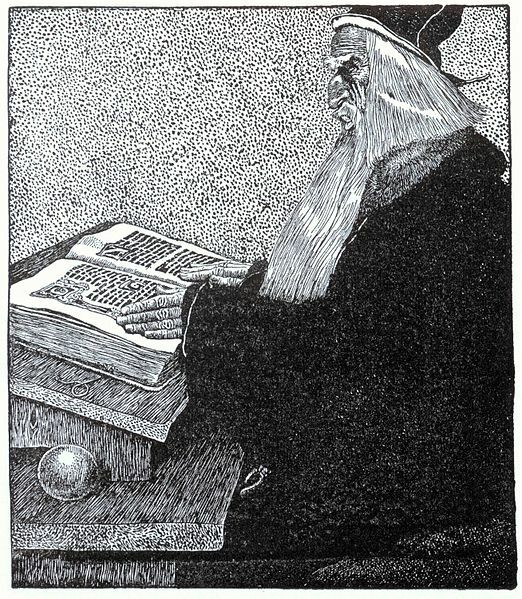 Merlin, as Druid is the repository of ancient wisdom and knowledge. Like the centaur who represents the sign, Merlin is half and half, with a human mother and a spirit father. Sagittarius, a mutable fire sign ruled by Jupiter, is known to have heavenly knowledge for divination and healing powers. 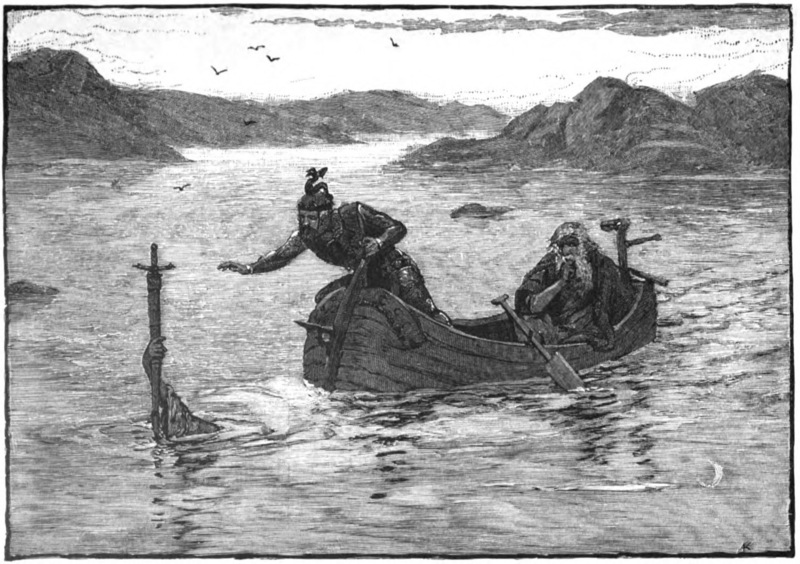 Merlin is the prime mover behind much of the Arthurian action. He arranges Arthur’s conception, gives him over to his foster family, and his prophetic wisdom indicates his connection to the divine pattern behind the unfolding of the stories. Capricorn is an earthy, cardinal, sign, ruled by Saturn. King Pellinore fits that description. He is most famous for his endless search for the Questing Beast, an earth dragon creature, but he is pivotal from the very first in Arthur’s rise to power. Hi role is Saturnic: first he breaks Arthur’s sword, drawn from the stone, and opposes his reign. But soon he comes to be a most faithful knight and supporter of the young king. Saturn, the rule of Capricorn is associated with ancestors. Pellinore has an important blood line, tracing his family to Joseph of Arimathea, the uncle of Jesus who brought the holy grail from the last supper to Britain. Dindraine, his daughter is the Grail maiden. His son Percival is the first to see the Grail, and Galahad, his grand nephew is finally successful as Grail Knight. He is the father of at least five of the Round Table knights. Aquarius, also ruled by Saturn, is a fixed air sign with a very different expression of Saturn. This sign embodies new forms and expressions, like Perceval who is the first to set off on the grail quest. Raised by his mother without any contact with other men or weapons, his manhood and knighthood are very original as might be expected of the Aquarian knight. His father is usually said to be Pellinore, the very traditional version of Saturn, while Perceval is the unique and novel expression of new forms and societal impulses associated with Aquarius, the water bearer. 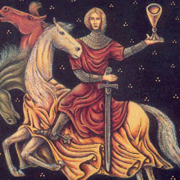 Since the Water Bearer is often shown with a vessel for water, it seems only appropriate that he who is successful in the search for the Grail represents Aquarius. Lord Pelles, the Fisher King resides in the Grail Castle in the role of Pisces. He has an incurable wound in his thigh, and his kingdom has become a wasteland because of this injury. Percivale visits his castle, but does not ask the important question, which would free Pelles from his injury and would repair the land. Pelles is called the Fisher King because, despite his injury, he can fish, a fitting connection to the sign of Pisces. Pisces is the dissolution of all form, in preparation for the beginning of the new cycle in Aries. It is a watery and mutable sign ruled by Jupiter and with a connection to spirituality, to illusion and to permeability. He is a keeper of the Grail because he too is a relative of Joseph of Arimathea. Despite his invalid status, he arranges for the birth of Galahad, by tricking Lancelot into the illusion that his daughter, Elaine is Guenevere. She conceives the child who will be the Grail Knight. The power of water and illusion are central to this story and to the sign of Pisces. Where else shall we look for Arthur in the night sky? When he is on the hunt with Gwyn ap Nydd (King of the Otherworld), we can find him in the winter sky with his sword Excalibur, and his dog Cabal (Orion the Hunter and Sirius) but there are other constellations, which traditionally hold his memory, and connect him to an important transition from dragon, to bear in the sky. If Arthur is much older than the medieval tales written about him, we may find clues in the stars about his early existence and genealogy. Because he is ‘Arth’ the Bear, we will look for him among the celestial bears. Polaris, the North Star, our pole star at the present time is part of Ursa Minor (the small bear), the still point around which the Northern heavens turn. Like Arthur this guiding star never sets and does not disappear with the change in season. One of the many names for Ursa Major, Large Bear, is Arthur’s Wain, his chariot, which he rides round the still point of the pole star in the sky. Due to the tilt of the earth, the role of the pole star passes from one star to another. Since the precession of the equinoxes takes about 25,770 years to complete a cycle, a single star typically holds that place for many centuries. 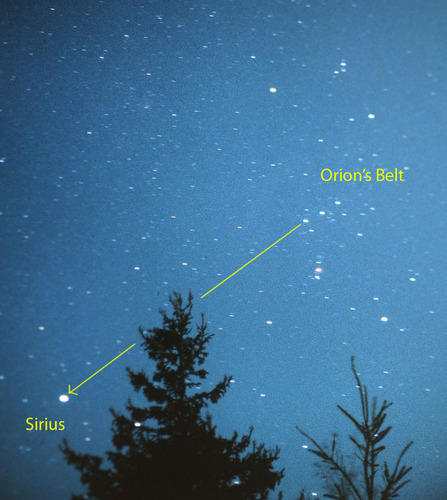 It is estimated that Polaris became the pole star about 3400 BCE. 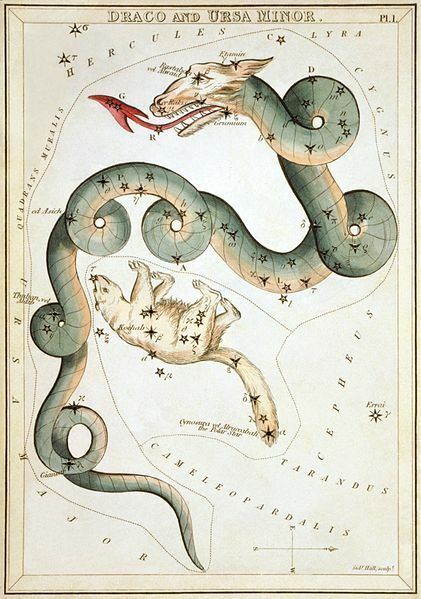 Before this, the still point of the Northern sky was Thuban, a serpent star found in the constellation, Draco, the Dragon. Arthur’s father was Uther Pendragon, the ‘head’ or ‘chief dragon’ At one time the constellation Draco appeared much larger and the Bears were held within his coils. Th’ ecliptic axis in his scaly folds. Was this switch of polestars a reason for the theme of ‘vanquishing’ the dragon in so many Arthurian stories? As the star in the tail of the Bear become central to the Northern skies, was this reflected in stories of a royal Bear (Arthur) who had replaced a Dragon (Uther Pendragon)? Arthur’s father, Uther Pendragon abdicated his central place as the star around which the heavens revolve, but, just as in the Arthurian story, this did not happen all at once. Arthur, who had been raised by a foster family, had to prove his right to kingship. To make this mythology more complex and intriguing, King Arthur, the mythological ancestor, has no legitimate descendant, no heir, unless it is all of the British people. Instead he returns, like the Sun at the winter solstice, sometimes called Alban Arthuan (the light of Arthur). 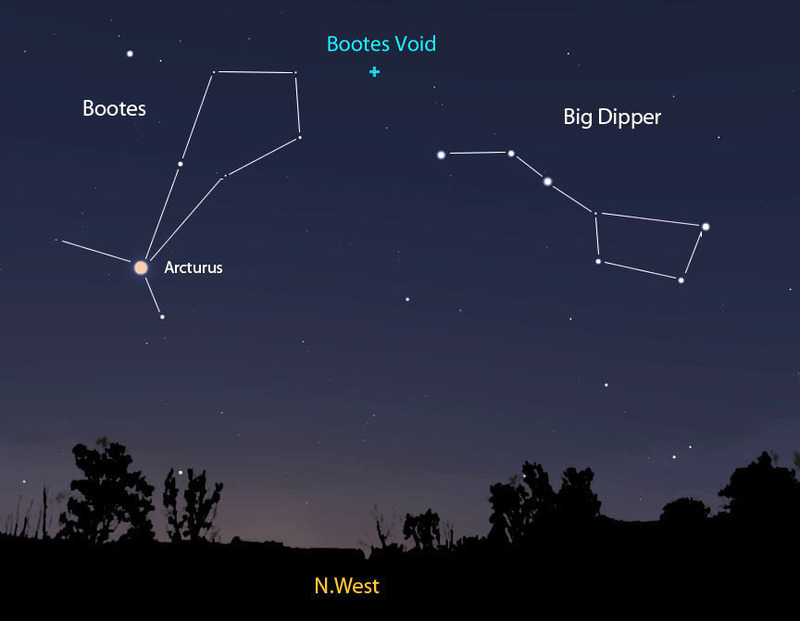 Another heavenly bear we might associate with Arthur is Arcturus, the brightest star in the constellation Boötes, the Herdsman. Arthur is connected in two ways. Arcturus was a Medieval spelling of Arthur, and it means ‘Bear Guardian.’ In a medieval variation on the story of his final journey to Avalon, Arthur is transported to Boötes where he lives forever in a crystal palace of Arcturus. Arcturus is a transitional figure who symbolizes the passage between the nomadic hunter’s way of life to the settled farmer. Nomadic people look to the stars for direction and guidance on their journey, while farmers note the stars for seasonal changes in the growing cycle. According to Ptolemy, Arcturus has the nature of Jupiter and Mars, a combination of which defines the spiritual warrior. This is the star of a powerful leader. Because Arcturus spans the border between the circumpolar and equatorial stars he is seen as indication of a leader who protects his people as they move toward new ways of life. Arthur’s story may begin at the transition between a Paleolithic hunter to the Neolithic farmer and herdsman and then reemerge at the time of change from tribal leaders to a more unified model of a kingdom under a single monarch. Arthur’s place among the bears in the sky is an indication of how old this story may be and how deep an imprint it has upon our imagination. He is the Bear of Paleolithic hunters amidst the most Northern stars, and the warrior king of Arcturus, who leads his people to a new concept of national identity. In every generation, poetry and song keep the story of Arthur alive. 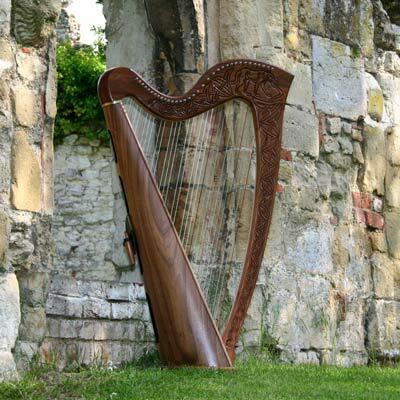 In light of that, it’s not surprising that Talyn Arthur (Harp of Arthur) was the name used by the Britons for the constellation, Lyra. If we are going to look for the Arthur’s court in the sky we might find Taliesin, the Bard and harpist of Arthur’s Court here in Talyn Arthur. He has his own epic stories, but occasionally is added to Arthur’s retinue as a mark of respect for both of them. The constellation Lyra is associated with Venus and Mercury by Ptolemy for they are the planets of beauty and communication, love and magic. This constellation is associated with a harmonious, poetic nature, skills in science and art, mixed with a bit of thievery, all part of the nature of Taliesin as well as Venus and Mercury. 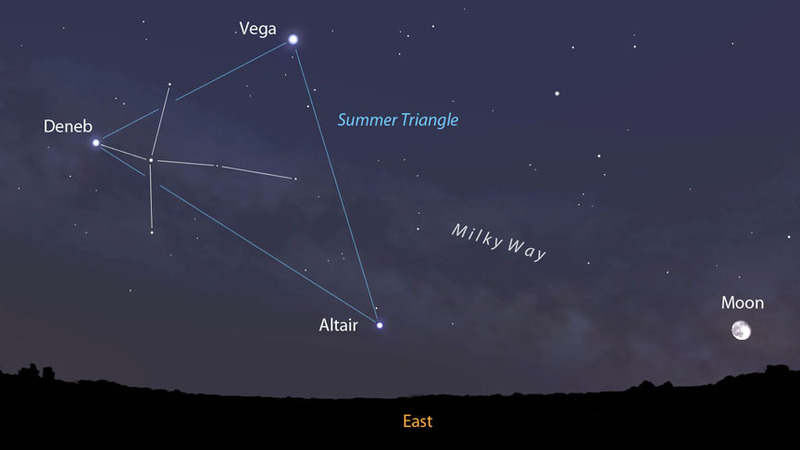 The most visible star in Talyn Arthur is Vega, one of the brightest stars in the summer sky. Vega was the pole star between 12,000 and 10,000 BCE. The Greeks connected Vega with their musician-magician Orpheus who shared many of the same magical, as well as musical talents of Taliesin. Like its constellation Lyra, it is associated with Venus and Mercury by Ptolemy, good planets for an artist or musician. Vega is one of three bright stars from three different constellations which form an asterism, the Summer Triangle. The other two stars are Deneb from Cygnus the Swan, and Altair from Aquila the Eagle. On summer nights when these three stars stand out so brightly, I imagine them as Arthur, Guenevere, and Lancelot. 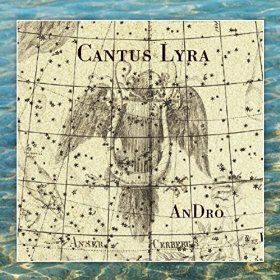 Arthur might be Vega in Talyn Arthur; Deneb shines for Guenevere in Cygnus the Swan; and Lancelot with Altair the bright star of Aquila the Eagle. Their love and friendship creates an evolving equilibrium, a triangle so powerful and eternal that it is reflected in the brightest stars of the summer sky. Deneb, Guenevere’s star in the Summer Triangle is part of the constellation, Cygnus the Swan, a bird associated with Venus. Deneb, the bright star in the swan’s tail, like Vega is associated with Venus and Mercury. Guenevere, so often abducted and returned unharmed, is much like the planet Venus who appears, then disappears as evening star to reappear at dawn. Guen as a prefix also means white or light and Venus is often called ‘the shining one.’ The older Celtic name for Venus was Windo-seibari, a white phantom, ghost, goddess, who binds through words, verbal magic, an association with Mercury. 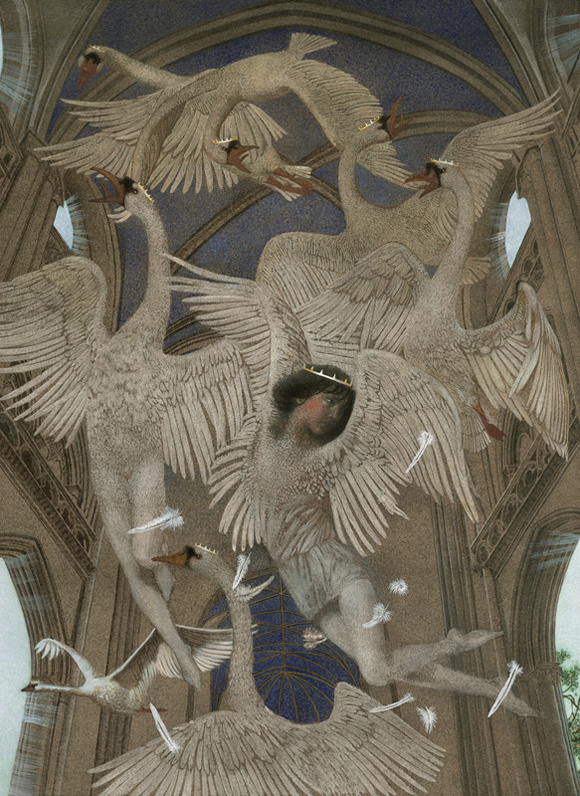 The constellation Cygnus, where Vega dwells can also be connected to shamanic practices for it was common for the Druid shaman to wear a cloak made of swan feathers. If we link Lancelot with Altair, the brightest star in the constellation, Aquila, the eagle, we get a flavor of Jupiter and Mars. Jupiter and Mars contact in a chart often marks a spiritual warrior. Those who have this combination will take action (Mars) to protect and serve their spiritual ideals (Jupiter). Lancelot is a spiritual warrior with a blend of Jupiter and Mars characteristics. Associated with courtesy and honor, Lancelot is gentle and complex. Altair is associated with daring, but also with relationship and deep caring for others. There is the watery side of Lancelot as well. He is the foster child of the Lady of the Lake, and must battle not only physical danger, but enchantment. As a link between the worlds of fairy and human he moves between the two realities, each with a desire for dominance. Lancelot was asked to choose between these two worlds, choose between the woman he loved and his love and loyalty to Arthur. As the bright star in the constellation Eagle, he flies above these demands. 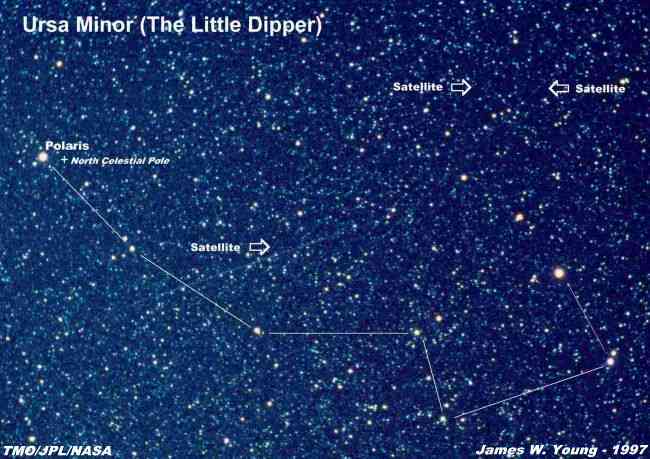 The Summer Triangle is a symbol of how three bright stars from three adjoining star patterns have come quite recently to be seen as a new star pattern. In the same way, the triangle created by Arthur, Guenevere and Lancelot marks an evolutionary way of looking at men and women, at relationship and the mystery that lies behind these stories reflected in the earth and in the sky.